Check out The Beano subscription offers! Expect to see all your favourite characters getting up to their usual tricks, like Minnie the Minx, The Bash Street Kids and, of course, Dennis and Gnasher! New issues of The Beano come out every single Wednesday – but if you don’t fancy racing down to your local shop to find out they’ve all gone then get yourself a subscription! 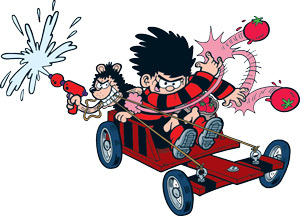 Join the Menace Squad and not you’ll get the latest issue delivered straight to your door every week – before you can even get it in the shops! Not only that but you’ll save £44 off the shop price! Think of all the water balloons you could buy with that! And if that wasn’t enough, you’ll also get a free personalised poster – just like this one over here! To check out the latest offers – hand-picked by Dennis himself – pop over to the Beano website!